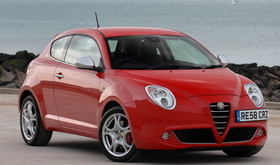 The MiTo could be one of Alfa's last new cars. TURIN -- Fiat S.p.A. could freeze new investment in Alfa Romeo under a strategic review of the money-losing brand ordered by CEO Sergio Marchionne. A product freeze is one of two alternatives that Fiat is considering to end years of losses and declining sales at its sporty premium brand. The other option is to refresh Alfa's lineup using Chrysler platforms to replace the aging Alfa 159 sedan and wagon and the discontinued 166 flagship sedan. Alfa's new-car sales have declined steeply in the past decade as its range became older and new products were delayed. Now it seems that Marchionne is losing patience with the struggling brand. Marchionne has ordered a review of Alfa to find out whether to allow the marque a final rebirth through Fiat's alliance with Chrysler or to leave the brand as it is with no new substantial investments after the introduction of the Giulietta lower-medium car in 2010. "We need to work a lot harder on Alfa to make an intelligent decision that effectively preserves the highest possible value to Fiat," Marchionne told Automotive News Europe in an interview at Fiat's headquarters here. Marchionne said Alfa had undergone too many reinventions. "We need to stop doing it. You cannot be a newborn Christian every four years. It's the same religion, eventually you need to own a religion and carry it to conclusion," he said. • Replacing the 159 with a D-segment sedan and the 166 with an E-segment sedan built in North America on Chrysler platforms, but unique to Alfa and sold by Alfa worldwide. • Freezing investment in the brand after the 147 hatchback is replaced by the Giulietta. This means that the 166 will not be replaced, leaving the brand with the Giulietta and the MiTo, Alfa's first small car, as its only fresh models. The rest of the Alfa range -- the 159, the Brera coupe, the Spider and the GT coupe will continue to be sold. Last year, Alfa sold 103,000 new cars compared with 203,000 in 2000. The brand has lost between 200 million and 400 million euros a year in the past 10 years, sources said. Fiat does not release separate financial results for any of its brands. Marchionne said Fiat's alliance with Chrysler could allow a high level of commonality between Alfa and the Chrysler platforms for the replacement of the 159 and 166, which was discontinued in 2007. "Certainly the availability of D and E segment (platforms) in the United States which are capable of being Alfa Romeoized is there. We need to look at the economics of that opportunity," Marchionne said. Marchionne is expected to announce the future of Alfa early next year, when the Italian automaker presents its 2010 to 2014 business plan. "By then we will know a lot more about what those architectures in the U.S. are capable of doing for Alfa," Marchionne said. He said Alfa will not integrate with Chrysler's Dodge brand, which has been speculated in some press reports. "The heritage of the Alfa and Dodge brands is completely different, the DNA is completely different. We would lose a lot of the appeal of Alfa Romeo if we try to Americanize it through a merger with Dodge," Marchionne said. Marchionne said he is pleased with the Mito, which was introduced in July 2008, and the Giulietta, which is due in March 2010. These two new products "are going to do a lot in advancing the DNA and the quality of the (Alfa) brand," he said. Fiat tried to reinvent Alfa with the introduction of the 156 in 1997. The 156 was hailed as a great-looking car. It had a platform specific to Alfa and was a huge success. Sales peaked at almost 120,000 units in 2000, but the 156 did not lead to an Alfa turnaround because no truly successful products followed it. The 156-based 147 hatchback got off a good start after its launch in 2000 with over 100,000 units sold from 2001 to 2003. But the arrival of German premium offerings such as the new Audi A3 in 2003 and the BMW 1-series in 2004 hit sales, forcing Alfa to lower the 147 market positioning to rival the VW Golf, a move that failed to halt the 147's sales slide. In 2005, Fiat tried another reinvention for Alfa with the 159, Brera and Spider range. These cars were based on a new platform but were plagued by excessive weight and low quality that always kept sales well below initial expectations of 120,000 units a year. Sales of the 159, Brera and Spider range peaked at almost 80,000 units in 2007.